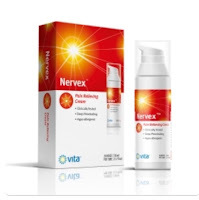 This cream is for use by those who have peripheral neuropathy, diabetic neuropathy, etc. I happen to have neuropathy from a tumor I had on my femoral nerve. So I ha e pain on my right thigh, foot, and calf. It feels as if I am being electrocuted at times. I also get the burning feeling, feeling as if there is water there, and other weird feelings. I have permanent numbness on one part of my thigh. This cream did help me. I applied it to my leg and found that it immediately helped relieve the pain I was experiencing. Thank goodness too. I take a large amount of narcotic pain mess but there are times when they don't work. This took a little of the edge off. I will ha e nerve damage the rest of my life and I will keep using this to help with my pain. All you need to do is rub it in and wait for a few minutes. It works almost immediately. It is also a good source of vitamin B12. The cream is odorless and it says it can repair some of the damage but I don't believe that. It cannot repair the chunk of nerve that is missing from my nerve.